Author's Note: This post was written in 2015. I no longer purchase Lularoe clothing for personal reasons, but my opinions below are accurate for the quality of their clothing circa 2015. It seems like everyone on Facebook is selling something these days. But don't get me wrong... if I want Jamberry Nails, Beachbody/fitness stuff, Thirty-One Gifts, Mary Kay, I've got a girl for each one and probably at least three on backup. (Note: Don't try to sell me anything, I only buy from people who don't try to push me!) So when my friend EM, who I am pretty sure dislikes that sales-y stuff on Facebook, invited me to a LuLaRoe party, I knew it had to be legit. Disclaimer: I bought my own LuLaRoe items, and I decided to provide my honest review. I don't sell this stuff, so just ask on Facebook if you want to buy some and I'm sure you'll get 1000 replies! Here is what I know, through the grapevine/internet, about LuLaRoe, from the perspective of a consumer. In a nutshell, a super-savvy network marketer who always wanted to start a clothing line realized that she could enlist help and reach way more people with her wares. She started a line of comfortable (and modest, as the company has LDS roots) clothing and it has since apparently taken off. Consultants invest a few thousand dollars (Google told me, you guys!) to buy their starting "shop" and then throw home-based and pop-up parties to sell clothing to their friends. In addition, the two consultants I know of through friends keep HUGE "VIP" Facebook groups where they also list the items they have in stock. Since LuLaRoe only makes 1000 pieces in each fabric (note: possibly more now, given it has taken off! ), some of this stuff goes like hotcakes. I recently witnessed grown women on Facebook going to pieces over holiday-themed legging prints, and even saw one woman throw a fit and actually depart a Facebook group over it. For. Real. I was intrigued by the fuss alone! To support my friend EM's party, I decided to shop! I was able to talk to the consultant about sizes/fits (there's a lot of info only about sizing up or down depending on a piece) as well as fabric. I was able to pick some items in stock on the Facebook group, tell the consultant what I wanted, and received an invoice very quickly. She made it clear that there are no returns, but you can exchange defective or otherwise unworn/unused pieces for whatever else she has. You guys, this is where I'll be Aubrey-honest with you. They make some stuff in really crazy prints. If that's your style, more power to you! But I found a lot of the prints to be polarizing (like you'd see on a Vera Bradley bag) and not something I would leave the house wearing. Other people live on the wilder side than me, I guess! That said, there were some prints that I LOVED and would absolutely wear, and some of the pieces had great texture to the prints too. I was naturally drawn to the solids and more subtle prints. The Amelia dress is why I came to the LuLaRoe page in the first place. Pockets, pleats, A-line silhouette... As my friend EM put it, they should rename this the Aubrey dress because I'll rock it all day every day. The Amelia dress runs $58 $65, which isn't cheap for a dress! However, I'd compare its quality to the Nordstrom dresses that I get via Stitch Fix, which definitely cost me more. I did find the hemline to be a bit long (remember it's a modest clothing line) but I can fix that easily. I could tell that this fabric was thick from the Facebook photos, which is what I wanted. Apparently the fall/winter fabrics are more substantial, so I love that! Not all Amelia dresses have this fabric/texture. The zipper is high quality, and I really love the dress. It will be worn regularly, and I've got my eye out for more Amelias. I believe they are worth the price based on how I felt wearing it. Comfort, comfort, comfort! And I can tell it will be a great dress for travel. 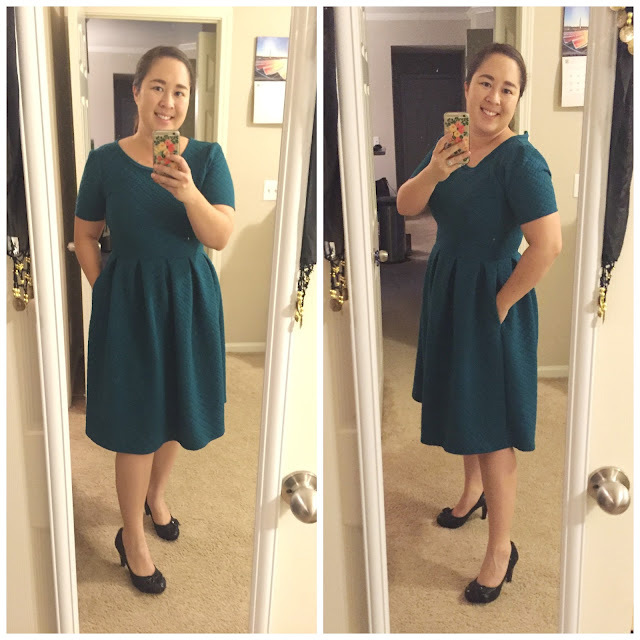 I've already worn my Amelia dress to a work meeting and then out on the town, so you can see that it can be dressed up or down. The Cassie skirt costs $30 $36, and I chose a mustard yellow because I love that color! 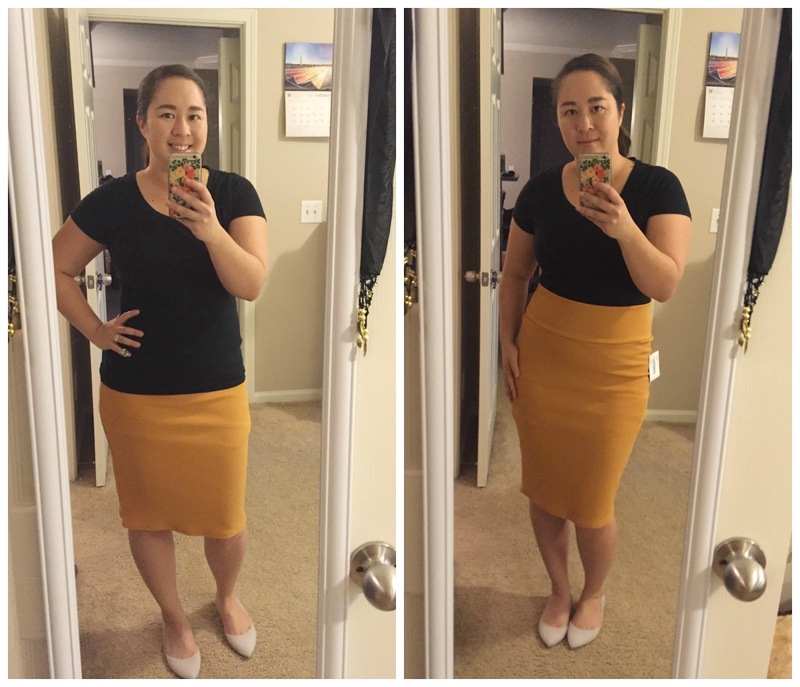 Pencil skirts are fun, and great for the office. It also had texture to it, so I was hoping for a more flattering, thick ponte knit skirt. I think this is where LuLaRoe sells the most product, and after trying their leggings I can see why. (Note: this is also where the prints go craziest!) They sell leggings in two sizes, One Size (OS) and Tall & Curvy (TC). At the recommendation of my friend, I went with TC sizing; I'm 5'4" but a size 10-12 in pants, so this felt comfy. The leggings run $21 $25 each. The fit was fine, and I love how high up the leggings go on me because, well, tummy. And they weren't crazy long either, despite my shorter height and getting the tall size. BUT YOU GUYS THEY ARE SO COMFORTABLE. I don't think I've ever worn such a comfy legging. I didn't even like the multi-colored print I chose as much once I got it, but I've already worn them around the house twice. FOR REAL. They are so soft, they feel like velvet and silk had a fuzzy, stretchy baby and you get to wear them on your legs like a second skin. OMG. I died happy about it. That said, I don't see a *ton* of legging prints that I want... they're a bit out there. But I hear they're coming out with solid leggings, and that got me all OMG again. Not to the extent I'd fight someone for them, but I will be buying these leggings again because they rock. And I think the $21 price point is fair, so good value for money. I want ten pairs, and I'm not exaggerating. 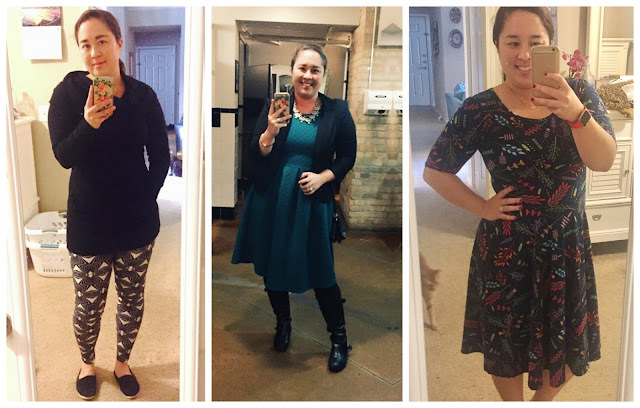 The Verdict: I will continue to keep myself in a few LuLaRoe Facebook groups (since every consultant gets different stuff), to keep an eye out for desirable Amelia dresses and leggings, which I feel are the best value. I will not, however, virtually battle or get angry at someone in order to get leggings with snowmen on them. Just not my thing! I like these clothes, when I find the right print. I do tend to lean towards more of the solids. 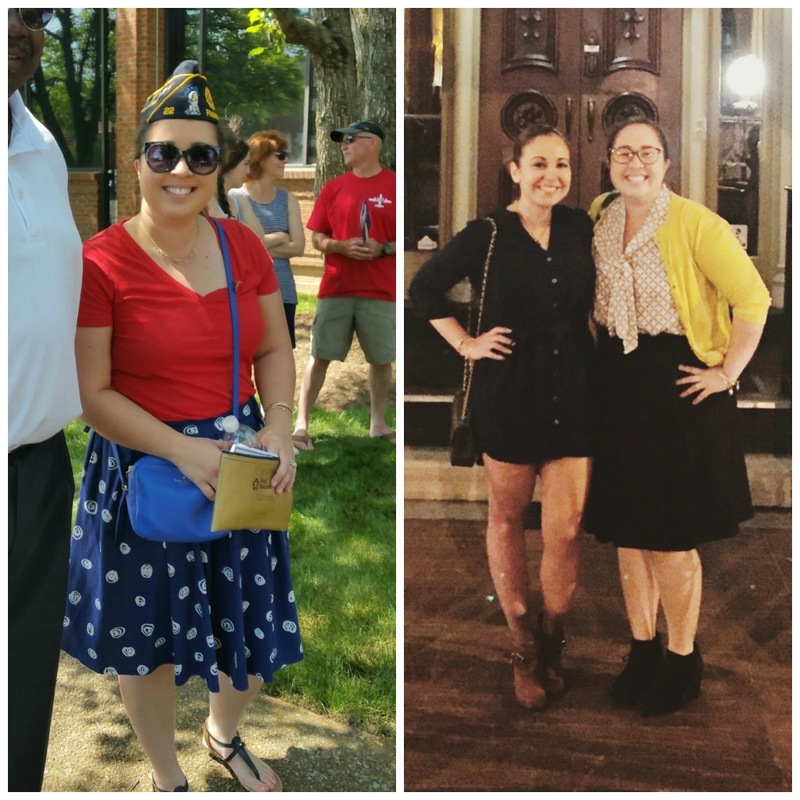 Since drafting this post, I have purchased more leggings, 5+ Amelia dresses, a Carly top/dress, Madison skirts (like the Amelia, but just the bottom with the pockets), and a Nicole dress pictured below. So I'd say I'm a fan now, and being very picky about fabric choices to get the most bang for my buck. I really like some of the consultants' online shopping interfaces, which are much easier to shop than Facebook albums. I do prefer the consultants who keep their entire stock "shoppable" all the time vs. the ones that just post them once a week for a limited time. I'm busy, and it doesn't give me much flexibility. So I've left some groups and joined others to find what I like. I've also found that if I'm tired of a LLR piece (or have pattern regret) and cleaning out my closet, these items have sold easily on Poshmark. 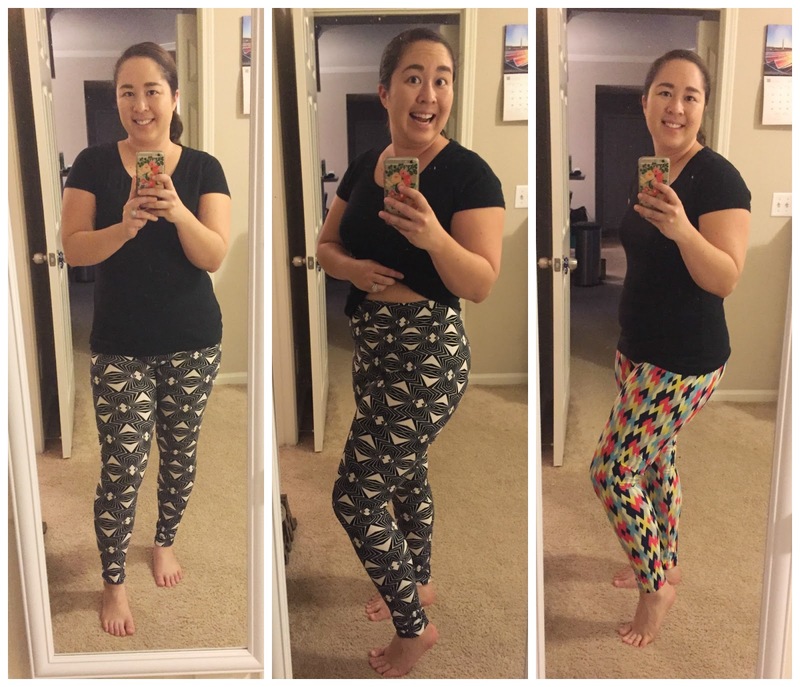 I have been able to sell used leggings for around $12, and most of the crazy prints I bought early on have been sold. They have better resale value than some of the brand-name things I've tried to sell, so that's kind of cool too! I've read quite a few comments below about quality issues with some of the pieces. If you get an item with defects, the consultant is supposed to offer you an exchange. I haven't had quality issues with any of my purchases over the last year, and the one time I got the wrong item, the consultant sent me a new one and let me keep both! That's why you stick to the good consultants, they'll take care of you. The bad ones just make everyone look bad. I follow three consultants right now who are friends or friends of friends. I don't have a problem with people venting or airing their grievances with these products in my comment section... but I can't really relate because I haven't had that issue yet. But I promise that I will keep this post updated for you. 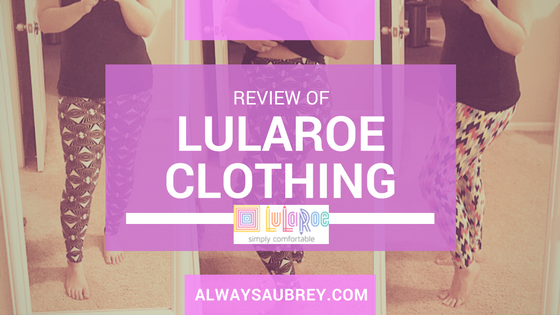 Disclaimer: I bought my own LuLaRoe items, and I decided to provide my honest review, so you can know before you buy.. I don't sell this stuff, but plenty of other people do.